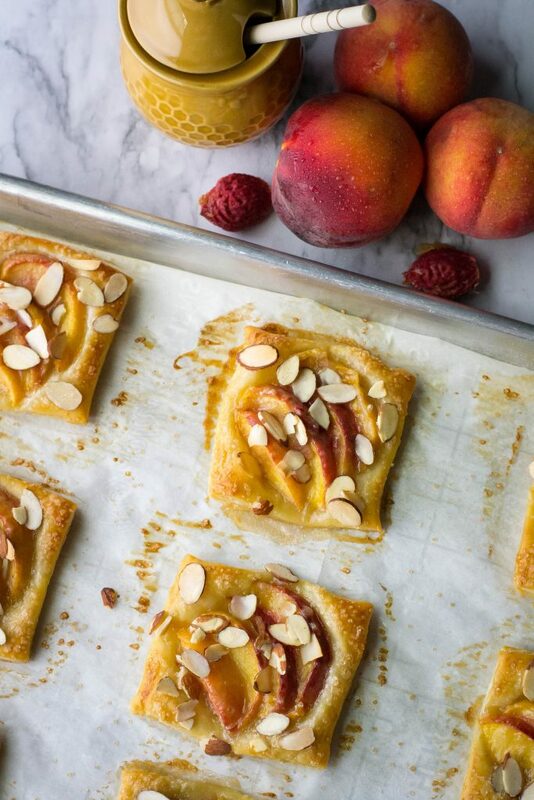 Easy Almond Peach Tartlets - What the Forks for Dinner? Researching recipes, sometimes you find out things you never knew……go figure. I discovered 4 things about peaches on a cute website geared to kids called CBC Kids . If you have kids, check it out. The is a variety of peaches called either Doughnut or Saturn that are more flat than round, a little less juicy, but not as messy. Lately I seem to have the need to “use up” stuff. I had a small amount of heavy cream and two peaches…. both needed to be used or tossed. 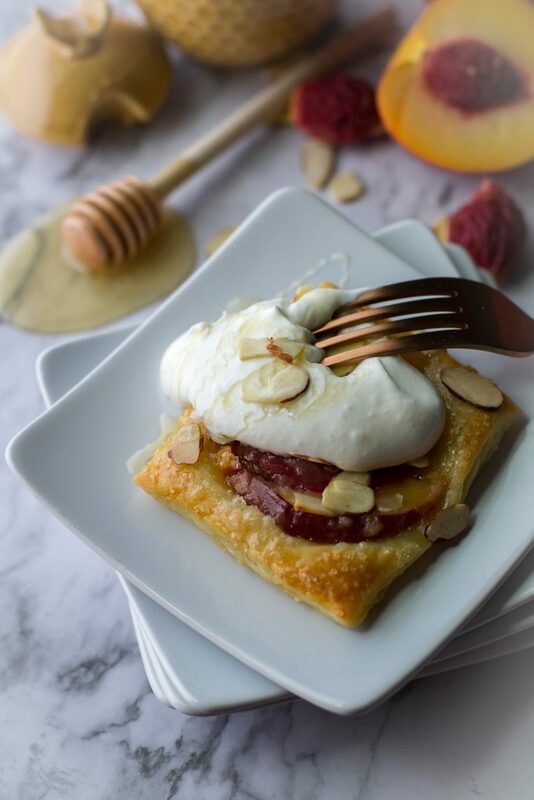 On….you guessed it Pinterest, I saw a beautiful picture of some delicious peach tarts. They were from Natasha at NatashasKitchen.com. This recipe is super easy, and quick to put together, and you probably have all the ingredients in your pantry or freezer. If you don’t have frozen puff pastry in your freezer, you really need to get some…..puff pastry can make anything sweet or savory into a golden flaky …..well anything. Some are intimidated by puff pastry, but never fear, the frozen variety is as easy to use as a pre-made pie crust. To make Easy Almond Peach Tartlets, all you need to do is unfold the pastry and cut it. It cuts into 9th’s easily. I know 9 is an odd number, but…..quality control check…..need I say more??? 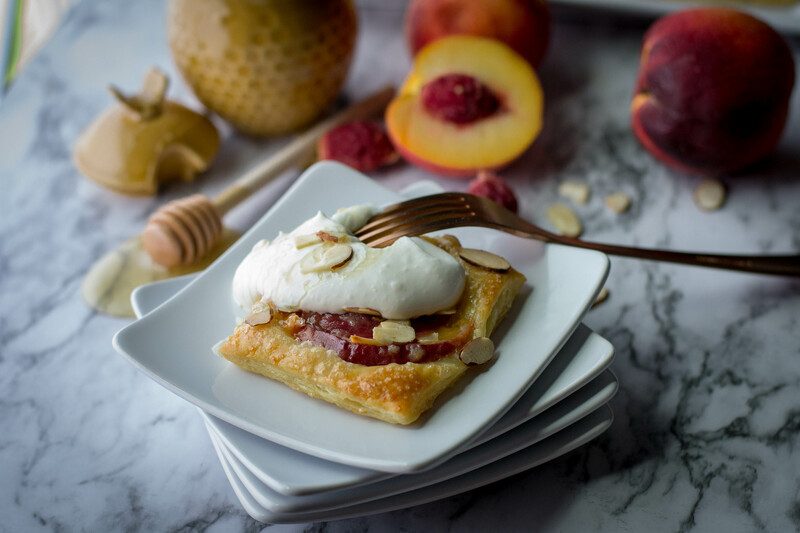 Peaches tossed with sugar, flour, nutmeg,vanilla, and almond bake into a luscious tartlet on top of the puff pastry. Brush the edges of the pastry with a beaten egg and sprinkle with turbinado sugar for that beautiful bakery shine. 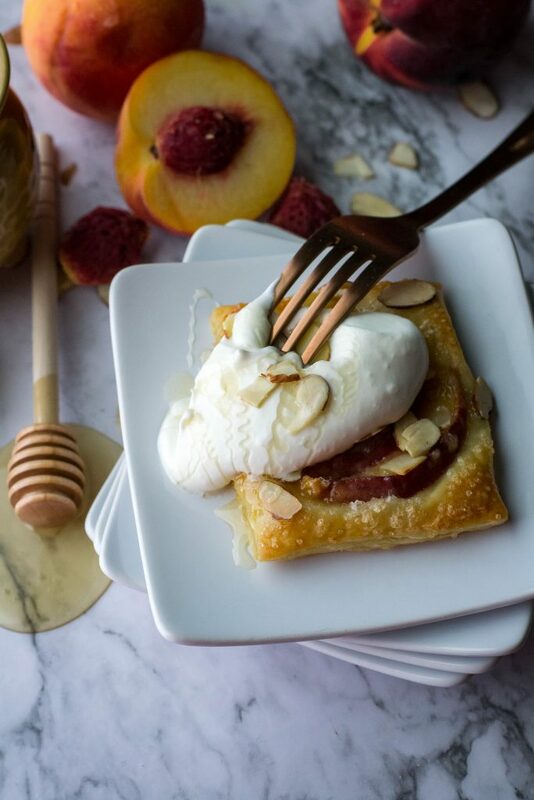 My left over heavy cream, mixed with vanilla and almond extract, and a touch of powdered sugar created a perfect topper for the peach tartlets. 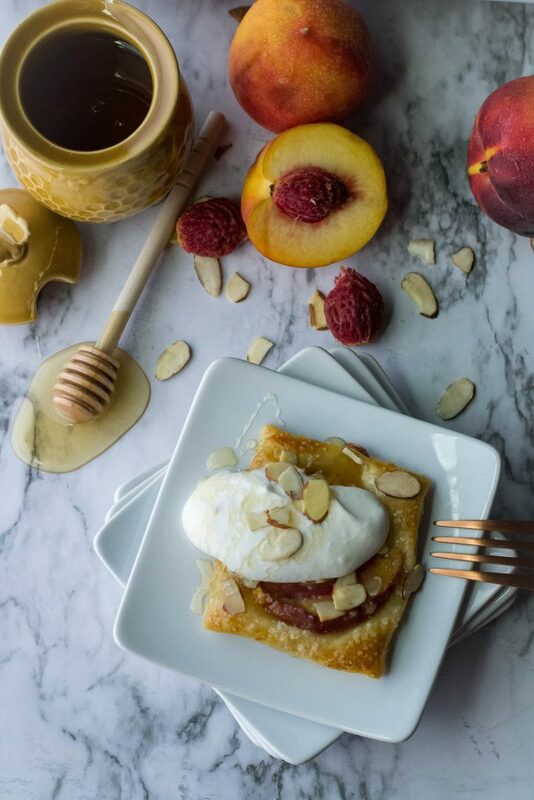 Some extra almonds and a drizzle of honey and you have a picture perfect dessert, that looks like you baked all day. 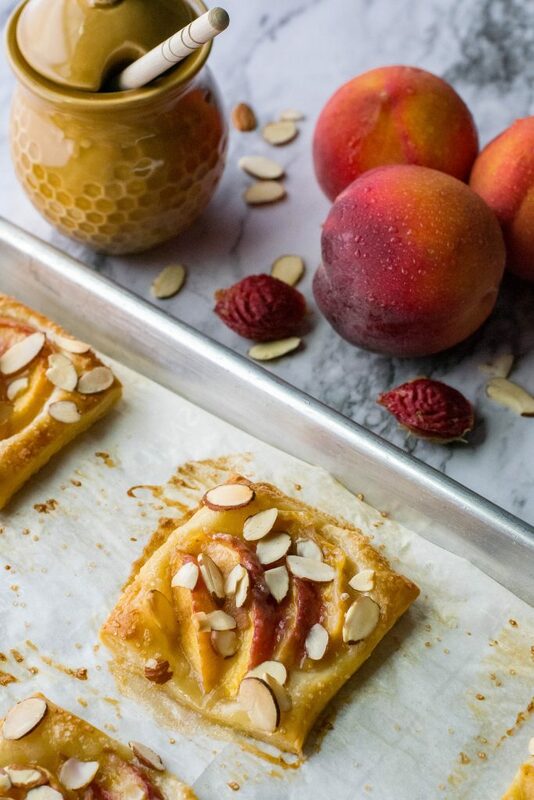 Show off those pretty peaches and your dessert making skills by making Easy Almond Peach Tartlets………you can do it! !